Here are a selection of questions that we get asked regularly, if you cannot see an answer to your question then please contact us with any queries. Can I Visit You At Kings Barn Trees? Our nursery is run as an 'online' business, our facilities are not open to the public. We can however arrange visits but only in special circumstances, and by prior arrangement. If you live locally or are in the area you are welcome to collect your order. If you are ordering through the website simply select the 'Collection' option during checkout. It's essential you let us know a rough time frame of your collection so we can get your order ready for you. Yes! You can enter a delivery address during the checkout process. If you've already ordered and need to change the delivery address, contact us asap as we can easily change the address if we've not booked the shipment with the couriers. Can You Ship Outside Of UK Mainland? Yes, however our automatic shipping prices generated during on the website are for UK mainland only. We are able to ship to Northern Ireland, Channel Islands, Scottish Highlands, Outer Hebrides etc but you need to contact us for a shipping quote. If you inadvertantly order from outside the UK mainland we'll contact you if there's an additional shipping charge due. Can You Ship To Europe / USA? We are able to ship our trees to anywhere within the EU (at the recipients own risk), however, due to international laws regarding soil and woody material we are currently unable to ship outside of the EU. Contact us for an EU shipping quote. You can specify delivery details during checkout, if you've already ordered then contact us and let us know which day you'd like to receive your order. How Much Is Shipping Going To Be? Exact shipping totals are calculated during checkout (for UK mainland), see the Delivery section for more detailed shipping prices. Can I Have My Order Delivered At A Certain Time Of Day? The couriers we use unfortunately do not deliver in specific time slots. If you nominate a Safe Place during ordering the parcel can be left the courier can leave it here if you are out. This can happen if the 'Send Confirmation Email' button is not clicked on the receipt page of the website. If you're concerned whether or not your order went through please contact us by email to check. Occasionally orders do not go through as normal. This can sometimes be because you have an item in your basket that is Out-Of Stock (especially if you have multiples). An error message will come up on the page. If your item is in stock then sometimes it's a case of simply trying again. Be assured that if your payment goes through more than once we will refund you immediately with no quarrels. If you are still having trouble paying through the website please contact us and we will do our best to help. We understand that not everyone likes using online shopping, we're very happy to talk to you to arrange an order. Send us a message with your telephone number and we will call you as soon as we can. Not a problem. Please contact us as soon as you can so we can amend or stop your order. Can You Send An Invoice Before I Order? Yes. If you require an invoice to clear payment funds with your company or establishment prior to placing an order we can send you an invoice via email. Our dispatch time is normally 1-2 working days. We do not ship Fri-Sun due to the living nature of most of our stock, any orders placed between Thurs-Sun are usually shipped out on the following Monday. If you are concerned about your order please contact us. The Tree I Want Is 'Out Of Stock', When Will You Have It Again? 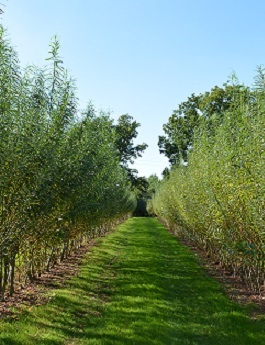 We keep our stock levels as up-to-date as possible - we can always check for you if the younger trees have grown enough since the last stock check to be shipped. So please contact us with any queries. We grow all our own trees from seed. This generally means that we only have the taller trees once the little ones have grown bigger! 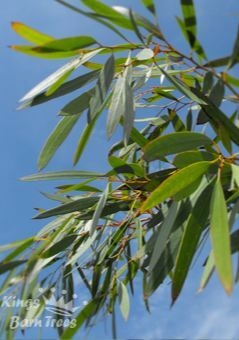 However, the growth rates in Eucalyptus are staggering, even the 'slow' growers can reach 1m new growth in a year. I Am Getting An Error Message: "General Script Error Occurred: Error: The input is NULL"
This is an odd problem that occurs mainly with the web browser Internet Explorer. You can try to load the page again, otherwise you may need to adjust your browser settings. Sometimes it can be related to accepting Cookies or it can be down to website filters such as 'SmartScreen Filter'. If you are still getting problems then please contact us so that we can help you. The most important thing to consider is the site: the temperature (lowest), the soil, any exposure to wind, how much sunlight, eventual height. Euc's cover a wide range of tolerances, help in choosing can be found in our 'How To Choose' section. If you are still stuck then please contact us with your needs and we can try to match a tree to you. 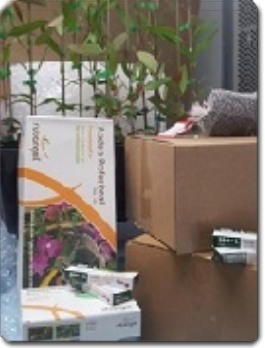 We keep our stock levels as up-to-date as possible - we can always check for you if the younger trees have grown enough since the last stock check to be shipped. So contact us with any queries. Why Are There Are Red/Black On The Leaves? This is no cause for alarm, it happens when the tree is too wet and too humid. The pores on the leaves cannot get rid of the water fast enough and the spots appear. 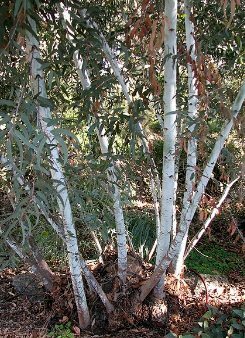 This often happens over the winter period as these Australian trees are not used to our moist winters. These marks will fade once the soil is drier and should not affect the overall health of the trees. Why Is There White Powdery Marks On The Leaves? This is simply because the nursery is located in a hard water area so we have water with high lime content. These marks should just wipe off and do not affect the health of the plant. Advice on this subject varies greatly! Staking is really for the roots rather than the tree. Using a low stake of around 3ft helps ensure the root ball stays in place and not get rocked around. The roots can then spread out and firmly anchor the tree. Two stakes may be required if the tree is large or in a windy location. 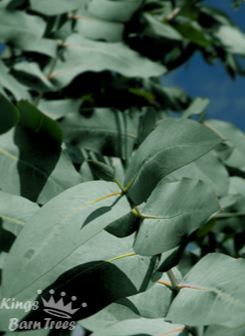 We would strongly advise against high stakes or tightly fitted ones as Eucalyptus are particularly prone to becoming heavily reliant on the stake. They put their energy and growth into height rather than width, if the stake is taken away the tree simply flops over. From this the tree will not recover. A stake should be taken away from the tree after 1-2 years. 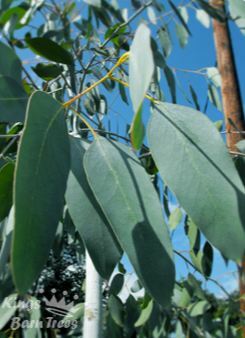 How Fast Do Eucalyptus Grow? Fast! Even the slowest Eucs we have here can still manage 1m new growth in a year. So called Slow can grow 0.5-1m per year, Medium 1-1.5m, Fast 1.5-2m. 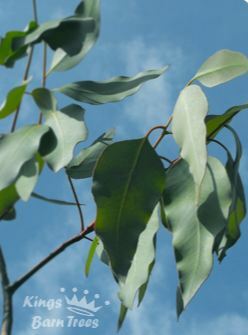 How Close To A Building Or Wall Can I Plant A Eucalyptus? The roots of Eucs are thirsty and vigourous. For this reason you should avoid planting them close to buildings, walls and drains. Exercise caution when choosing a site to plant. There Is A Pest Insect On My Eucalyptus, What Is It? It is most likely to be a Blue or Red Gum Psylid. An aphid like pest, feeds on the sap of the new growth, when the young hatch they leave a fluffy white substance around the stems which can rot and then set into the leaf. These pests are no major threat to a tree, but can affect the growth patterns of younger trees by destroying new buds. They can be managed using normal pesticides, or if you want something more organic you can use a Soft Soap solution plus do you best to attract Ladybirds and Lacewings to the area which feed on them. It is important to try to remove the fluffy white substance from the new growth or it can start to rot. You can blow or brush it away easily. The pests are not new to the UK, they were first recorded in the 1920's and a fairly widespread. We inspect all our trees very thoroughly before shipping for the pests. 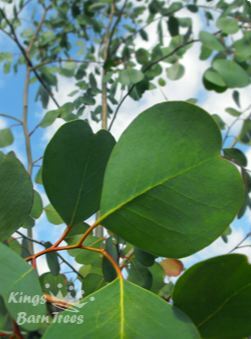 Can You Provide Eucalyptus Cuttings? The short answer is unfortuanatley no. We do not produce enough material from pruning our trees to be able to provide cuttings for customers wanting to use for dying in arts and crafts or for feeding exotic animals like Sugar Gliders. We can only provide whole plants for customers to grow on themsleves.